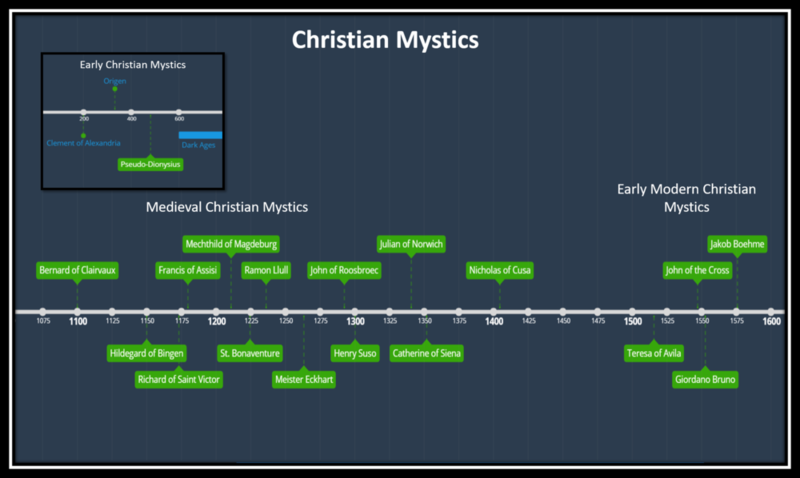 Falling into three rough eras of the Early (or Classical), the Medieval, and the Early Modern Mystics, there seems to be a mystical flowering on the tail end of great movements in science, culture, and the arts, like a spiritual capstone on the epoch. To listen to our recent episode of the Contemplative Light Podcast providing an overview of the Christian Mystics and our experience developing the course, click here. To learn more about our upcoming course Living Sacraments: The Christian Mystics & The Inner Journey To God, click here! What Are The Three Golden Eras Of Christian Mystical Flowering? What Are The Four Mystical Types? Origen's conception of God is apophatic, ultimately a changeless unity beyond the human capacity to comprehend, and therefore communicable only in negative terms. He is unchangeable and transcends space and time. The revelation or self-emanation of God required him to first create the Logos to mediate between God and creation. The Logos is the rational creative principle that permeates the universe, acting on all human beings through their capacity for logic and rational thought, and guiding them to the truth of God's revelation. Drawing on Neoplatonic teachings of Plotinus and Christianity, Dionysius was the first the write an explicitly Mystical Theology in which he wrote of the divine darkness that transcends concepts, language, and image. Unto this Darkness which is beyond Light we pray that we may come, and may attain unto vision through the loss of sight and knowledge, and that in ceasing thus to see or to know we may learn to know that which is beyond all perception and understanding. A great reformer of the Benedictine order in the 12th century, Bernard was instrumental in re-emphasizing the importance of lectio divina and contemplation on Scripture within the Cistercian order. Bernard observed that when lectio divina was neglected monasticism suffered. Bernard considered lectio divina and contemplation guided by the Holy Spirit the keys to nourishing Christian spirituality. Abbess, artist, composer, Hildegard was a visionary German mystic who shared her cosmic vision that God's love extended both outward to the vast expanse of the universe and inward to the individual human psyche. 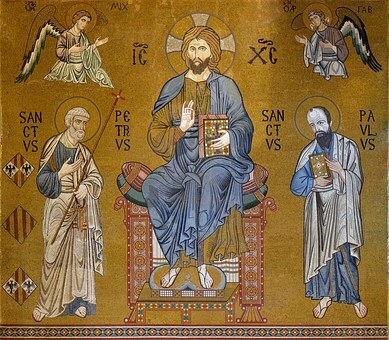 Richard was a systematic mystical theologian, who sought to defend the use of reason and logic to provide a framework for faith, whose contributed a key notion of condilection, or mutual love of a third being a central characteristic of the Trinity. The beloved monk and founder of the Franciscan Order, St. Francis embraced a life of simplicity and poverty, spreading a message of God's universal, boundless love for all creation. Praised be You my Lord with all Your creatures, especially Sir Brother Sun, who is the day through whom You give us light. And he is beautiful and radiant with great splendour, of You Most High, he bears the likeness. A visionary mystic, Llull advocated the conversion of Muslims through prayer not military action. A prolific writer and Franciscan tertiary, Llull developed a philosophical system in a work called the Ars Magna to help other Christians convert Muslims. Bonaventure studied deeply of Llull's work, bringing it to a higher prominence. Mechthild had her first mystical vision at age 12 and later joined the lay Beguine movement. She became a Dominican tertiary and with the encouragement of the Dominicans, composed the spiritual classic The Flowing Light of the Godhead. A prolific scholar, cleric, writer, and statesman, Bonaventure studied in Paris alongside Thomas Aquinas and became one of the foremost Franciscan intellectuals. His mystical works included The Soul's Journey Into God and The Mystical Vine. Oversold as a maverick and iconoclast, Eckhart von Hochheim interpreted scripture allegorically. His teaching led to the Friends of God movement in Germany. Eckhart taught of God's overabundant love illuminating the Word in each of us. His emphasis on detachment has made his teaching a lynchpin for many Eastern teachers to connect with Western audiences. A member of the Friends of God and an evangelist on behalf of the teachings of Meister Eckhart, Suso taught about the centrality of Eternal Wisdom, a personified female form of divine essence, in the spiritual life. A Flemish mystic, John of Ruusbroec wrote the Seven Steps of The Ladder of Spiritual Love about the active, the interior, and the contemplative life, corresponding to the three types of Christian prayer: verbal, reflective, and contemplative. An anchoress attached to a church in Norwich, Julian had a vision during a near death experience, seeing the image of a bleeding Christ above her bed during the last rites. After she recovered, she set down her sixteen visions or "shewings" in her work Revelations of Divine Love. A tertiary Dominican, Catherine wrote of the experiential life of incorporeal union with God. Her work The Dialogue of Divine Providence is a dialogue between the soul ascending to God and God Himself. A German philosopher, theologian, lawyer, and astronomer, Nicolas advocated a learned ignorance or kind of "beginner's mind" for moving toward Divine Union with God. Teresa showed great devotion to the Virgin Mary as her spiritual mother and experienced a four-fold movement of the Devotion of Heart, Devotion of Peace, Devotion of Union, and Devotions of Ecstasy in her spiritual life. A Carmelite Friar, John of the Cross (Juan de la Cruz) wrote allegorical works of the mystical experience, including The Ascent of Mount Carmel, The Dark Night of the Soul, and The Living Flame of Love. A Dominican Friar, mathematician, and cosmologist, Bruno challenged the Copernican model of the universe and taught a version of reincarnation or "transmigration of the soul." He was charged and executed by the Roman Inquisition. In his work The Heroic Frenzies, he writes of love as a means of mystical ascent. A unique figure among mystics, Boehme's teaching is largely consistent with Lutheran orthodoxies, but in his work The Way To Christ, he describes his mystical experiences and describes God the Father as a living fire, his Son the light of the fire, and the Holy Spirit the divine life. There are also traces of alchemical teachings in his work. A Carmelite and Doctor of the Church, Therese became known as The Little Flower and taught that by divine union of love the soul takes on the semblance of Christ. Therese suffered much and died young, but passed on her teaching of identifying with the suffering Holy Face of Jesus in her book The Story of a Soul. 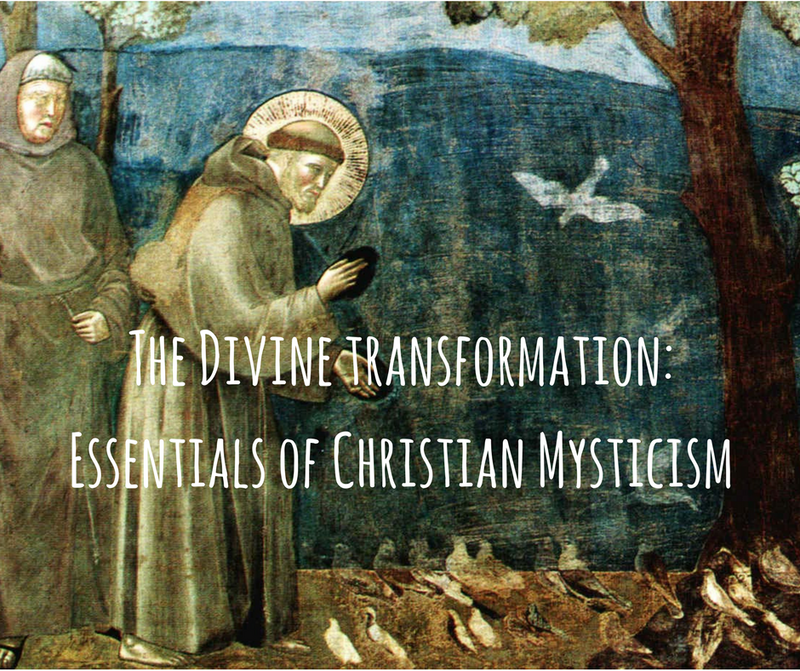 One of the most prolific Christian Mystics of the modern era, her work Mysticism has become a touchstone for modern mystics from Merton to Rohr. In her work, she outlines the five stages of the mystical life: Awakening, Purgation, Illumination, The Dark Night of the Soul, and Divine Union.